King's Highway 403 (pronounced "four-oh-three"), or simply Highway 403, is a 400-series highway in the Canadian province of Ontario that travels between Woodstock and Mississauga, branching off from and reuniting with Highway 401 at both ends and travelling south of it through Hamilton (where it is also known as the Chedoke Expressway) and Mississauga. It is concurrent with the Queen Elizabeth Way (QEW) for 22 km (14 mi) from Burlington to Oakville. Although the Highway 403 designation was first applied in 1963 to a short stub of freeway branching off the QEW, the entire route was not completed until August 15, 1997, when the section from Brantford to the then-still independent Town of Ancaster was opened to traffic. The section of Highway 403 between Woodstock and Burlington was formally dedicated as the Alexander Graham Bell Parkway on April 27, 2016. The majority of Highway 403 is surrounded by suburban land use, except west of Ancaster, where it passes through agricultural land; Brantford is the only urban area through this section. In Hamilton, Highway 403 descends the Niagara Escarpment, then wraps around the northern side of Hamilton Harbour to encounter the QEW. From there, co-signed with the QEW, it travels straight through Burlington and Oakville, departing from the QEW to the north at the Mississauga–Oakville boundary. The freeway then crosses through the centre of Mississauga in an east–west direction, serving its city centre, before turning north. Highway 403 then ends at Highway 401, but the physical freeway continues north of Highway 401 as Highway 410 to Brampton. Highway 403 begins at a junction with Highway 401 on the outskirts of Woodstock. The eastbound lanes split from eastbound Highway 401, whereas the westbound lanes merge into westbound Highway 401. It travels along the back lot lines of the second concession south of former Highway 2. It passes beneath Oxford County Road 55 (formerly Highway 53) and curves southeast. After crossing into the third concession, it curves back to the east. The highway travels straight for several kilometres, meeting with the southern leg of Highway 24, which travels south to Simcoe. The highway crosses the Grand River to the south of Paris, then passes over former Highway 2 as it enters Brantford. As it passes through Brantford, the highway angles southeast and passes beneath the northern leg of Highway 24 and then the Wayne Gretzky Parkway. The route exits the small city to the east and curves northeast shortly thereafter. It travels between Jerseyville Road and former Highway 2 to Ancaster, jogging to avoid cutting through Dunmark Lake. As the freeway enters Ancaster, it once again crosses former Highway 2 and dips through the southern side of the town. East of Ancaster, the freeway passes through a short greenbelt, with Hamilton Golf and Country Club lying to the north. A divided segment of Highway 6 meets the freeway and continues concurrently with it through Hamilton; to the south, Highway 6 travels to John C. Munro International Airport, Caledonia, and Jarvis at Highway 3. Continuing east, Highway 403 and Highway 6 curve north into Hamilton and meet the Lincoln M. Alexander Parkway before abruptly turning to the east and descending the Niagara Escarpment. Scenic views of Hamilton, its harbour, and Lower Princess Falls are along this steep descent. At the bottom of the escarpment the highway travels through a narrow, heavily developed corridor alongside former Highway 8. It passes beneath multiple bridges in a depressed trench, eventually curving north at a sharp corner and passing beneath more bridges. This section features a reduced speed limit of 80 km/h (50 mph) as opposed to 100 km/h (62 mph). The highway returns to ground level alongside the Chedoke Creek, a now-channelized river from which the freeway may take its name. 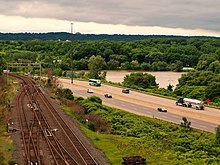 As the freeway continues north, it crosses an isthmus between Hamilton Harbour and Cootes Paradise alongside several roads which it has served to replace. It circles around the northern shore of Hamilton Harbour and returns to an eastward orientation. The concurrency with Highway 6 ends at an interchange where Highway 403 continues east and Highway 6 departs north towards Guelph. The freeway continues straight for several kilometres and encounters the Queen Elizabeth Way and Highway 407 at the Freeman Interchange. Highway 403 just south of the interchange with Highways 401 and 410 In Mississauga. 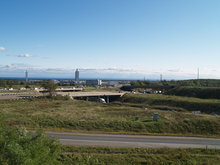 Highway 403 and the Queen Elizabeth Way converge at the Freeman Interchange in Burlington. Highway 407 ETR also begins at this junction. Highway 403 travels concurrently with the QEW for 22.6 km (14.0 mi) between the Freeman Interchange and Oakville, a straight section surrounded almost entirely by commercial units and warehouses. At the Ford Assembly Plant near the Halton–Peel regional boundary, Highway 403 branches off from the QEW and heads north for 5 km (3.1 mi) along the western edge of Mississauga. Here it interchanges with Highway 407 again, but the two freeways curve at 90 degrees to avoid each other. Highway 407 continues to the north and west, while Highway 403 turns east to follow alongside a hydro corridor through the centre of Mississauga. From this interchange to Highway 401, high-occupancy vehicle (HOV) lanes are present in the shoulder lanes for vehicles with at least one passenger. Sandwiched between residential subdivisions on both sides, the freeway passes beneath Erin Mills Parkway and crosses the Credit River. On the other side of the river, Highway 403 skirts to the north of downtown Mississauga, as well as the Square One Shopping Centre. It passes beneath Hurontario Street (formerly Highway 10) and begins to widen before abruptly curving to the north as it approaches Cawthra Road. As the curve ends, the freeway widens further into ten lanes. This short section passes beneath Eglinton Avenue and begins to diverge into a sprawling interchange with Highways 410 and 401, where the route terminates. The highway meets Highway 410, which runs northward to Brampton, at the collector lanes, just south of Highway 401, where the highway curves east and ends soon after by feeding into both the eastbound collector and express lanes. The interchange in 2013, looking north (Highway 401 was being widened west of the interchange), prior to the addition of the loop ramp in the NE quadrant to connect Highway 403 eastbound with Highway 401 westbound, and a directional ramp from Highway 401 eastbound to Highway 403 westbound in the SW quadrant. The ramps were opened in 2018. Highway 401 between Highway 410 and Highway 403 in Mississauga, showing the two sets of ramps to link 401 and 403, since each has a collector-express system. Though one of the first divided highways conceived for Ontario, Highway 403 is one of the most recently-completed freeways in the province; the multiple segments of the route did not become continuous until 2002. Planning for the route was underway by 1958, with the completion of the Freeman Bypass along the QEW providing a three-legged junction for the new freeway. Sections of Highway 403 through Hamilton opened between December 1963 and September 1969. An isolated section known as the Brantford Bypass was opened in October 1966, and would remain unconnected to other freeways for over 20 years. Plans for a third segment through Mississauga were contemplated throughout the 1960s, but were not finalized until late 1977, after which construction began. Portions opened at both ends in 1980 and 1981, while the central gap, crossing the Credit River, was completed in December 1982. Construction to bridge the gaps in Highway 403 between Ancaster and Woodstock was carried out over three major phases. The first phase was a short extension of the Brantford Bypass beginning in 1975. Later, work began to connect that extension with Highway 401 near Woodstock, opening in 1988. The last phase, between Ancaster and Brantford, was opened in 1997. The final discontinuity, between Burlington and Oakville, was signed as a concurrency with the QEW in 2002. Originally, this section was to have travelled along the corridor occupied by Highway 407, until budget shortfalls in 1995 resulted in a change of plans. 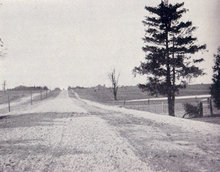 Highway 2 near Woodstock was widened into a divided four lane highway by 1936 and is one of the precursors to Highway 403. The corridor that connects London and Hamilton has always been considered important to Ontario. In late October 1793, Captain Smith and 100 Queen's Rangers returned from carving The Governor's Road 32 km (20 mi) through the thick forests between Dundas and the present location of Paris. John Graves Simcoe was tasked with defending Upper Canada from the United States following the American Revolution and with opening the virgin territory to settlement. After establishing a "temporary" capital at York, Simcoe ordered an inland route constructed between Cootes Paradise at the tip of Lake Ontario and his proposed capital of London. By the spring of 1794, the road was extended as far as La Tranche, now the Thames River. Today, most of this route forms part of former Highway 2 and former Highway 5. The paving of the divided four-lane Middle Road, with gentle curves, a grass median, and grade-separated interchanges, would set the stage for the freeway concept. It was the first intercity freeway in North America when it opened in June 1939. Thomas McQuesten, the new minister of the Department of Highways and the man most responsible for the Middle Road, decided to apply the concept to sections of Highway 2 plagued with congestion. A portion east of Woodstock was rebuilt in this fashion, but World War II would put an end to McQuesten's ambitions, at least temporarily. The end of the Korean War in 1953 heralded the resumption of freeway construction in Ontario; the advances in machinery more than made up for lost time. The construction of Highway 401 across the province took first priority. However, the opening of the section of Highway 401 from Highway 4 near London to Highway 2 east of Woodstock on May 31, 1957 would complete part of the route required between London and Hamilton. By 1958, planning on the Chedoke Expressway, or Controlled Access Highway 403, was well underway, though plans for a four-lane freeway between Woodstock and Hamilton existed as early as 1954. The opening of the Freeman Bypass of the QEW in August 1958 provided a connection point for a new freeway, and construction began the same day that the Burlington Bay James N. Allan Skyway opened: October 31, 1958. Highway 403 between Longwood Road (Highway 2) and the QEW was opened to traffic on December 1, 1963 at a length of 9.0 km (5.6 mi). Work was already underway on the next section of the route that would extend it to Aberdeen Avenue. That section opened on July 9, 1965, extending the freeway by 3.7 km (2.3 mi). Meanwhile, to the west, work had begun on a bypass of Brantford. The new freeway passed north of the city between Paris Road in the west and the junction of Highway 2 and Highway 53 in the east, a distance of 10.3 km (6.4 mi); it opened October 31, 1966. A portion of the Brantford Bypass was itself bypassed in 1997 when the final section of Highway 403 was completed and is known as Garden Avenue. However, the Brantford Bypass would remain an isolated section of Highway 403 for over 20 years. In Hamilton, work was underway on an extension of the Chedoke Expressway to Mohawk Road, crossing the Niagara Escarpment. This tedious project, which required extensive rock blasting, was soon accompanied by construction from Mohawk Road to Highway 2 near Ancaster. Both projects were completed together and originally scheduled to be opened with a ribbon-cutting ceremony on August 22, 1969. However, local residents complained the new section lacked any barriers preventing children from wandering onto the highway, postponing the ceremony until August 27 as temporary snow fencing was erected. This proved inadequate, and protests grew more vocal over the following week. Several petitions were presented to Deputy Highway Minister H. Howden on August 26, and the ceremonies were cancelled. Over the following week, Minister of Highways George Gomme met with residents and reached a compromise whereby a 24–hour patrol was established to watch for children until a proper fence could be constructed. The route was opened on September 3, without any ceremony. This completed the Hamilton section of Highway 403. Planning for the segment of Highway 403 through Mississauga dates to the late 1950s when the Hamilton Expressway appeared on the Metropolitan Toronto's regional transportation plan. It was to be a continuation of the Richview Expressway, which was ultimately never built, continuing from Toronto to Hamilton. The plan featured the expressway's eastern terminus at the Highway 401 and Highway 427 interchange. As Toronto's anti-expressway movement gained momentum, provincial plans shifted the Hamilton Expressway to the west near Etobicoke Creek. In 1962, the right-of-way alongside the hydro corridor between Burlington and Etobicoke Creek was protected after traffic studies indicated the need for a future freeway. On May 25, 1965, the Department of Highways unveiled the Toronto Region Western Section Highway Planning Study. The plan designated Highway 403 north from Burlington and then parallel with the QEW to Highway 401 near Highway 27. By the time construction was actually underway, plans had been completely modified to connect the overburdened QEW at Oakville with Highway 401 at the new Highway 410 interchange. This interchange was a better connection point for Highway 403, but would also require the widening of Highway 401 from six lanes to twelve. Plans were submitted and approved in December 1977 by Mississauga city council, and construction began. The new freeway opened in sections during the early 1980s. The first section between Cawthra Road and Highway 401 was opened August 18, 1980. This was followed by a short section from Highway 5 (Dundas Street) south to the QEW at Ford Drive, which opened in mid-1981, with a further extension to Erin Mills Parkway opening on November 17th of that year. The final section to be opened took the longest to complete, involving construction of two bridges over the Credit River valley; it opened on December 2, 1982. The cost of the entire 22 km (13.7 mi) Mississauga segment was $87 million. Around the same period, the Ministry of Transportation began to study upgrading Highway 401 to a collector–express system between Renforth Drive and Highway 403, and along Highway 403 between Highway 401 and Highway 10. 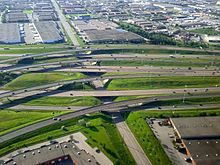 This took place between late 1982 and the summer of 1985; the existing outermost ramps from Highway 403 to Highway 401 eastbound were re-designated to serve collector traffic, as a pair of flyover ramps were added inside the interchange to serve motorists in the express lanes. Highway 401 junction with Highways 403 and 410 in 1987. Note the unused right-of-way in the middle of the interchange reserved for the future Highway 401 express lanes and flyover ramps to Highway 410. Highway 401 which was widened between 1982-85 to a collector / express system in order to accommodate Highway 403 traffic. The right-of-way originally intended for Highway 403 between Cawthra Road and Etobicoke Creek was eventually used for a controlled access arterial extension called Eastgate Parkway, which was planned beginning in 1982. The extension was built between 1988 and 1994, incorporating a portion of Fieldgate Drive at the eastern end. The first section, between Cawthra Road and Dixie Road, opened in early 1991. This was followed several years later by the section from Dixie Road to Eglinton Avenue that opened in late 1994. 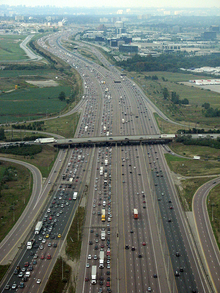 In the fall of 1991, alongside the widening of Highway 410 into a full freeway, construction began on the connecting ramps between Highway 403 and Highway 410, which pass under the existing bridge structures for Highway 401 collector traffic, while new overpasses were constructed in the centre for Highway 401 express lanes. The loop ramp from Highway 410 southbound to Highway 401 eastbound was replaced by a semi-directional high-speed flyover, while a new directional ramp and semi-direction flyover were added to serve westbound Highway 401 commuters. Prior to the opening of this link, traffic from both freeways was forced onto eastbound Highway 401. The 2.2 km (1.4 mi) link opened on November 2, 1992 at a cost of $7.3 million. Highway 403 eastbound at the Grand River bridge near Brantford. The stretch between Woodstock and Hamilton was rehabilitated in 2011, which included installing central guardrails and paved shoulders. In 1975, construction began on a westward extension of the Brantford Bypass, from Highway 2 (Paris Road) to Rest Acres Road, which would become Highway 24. This work consisted of the twin bridges over the Grand River and an interchange at Rest Acres Road. The Canadian National Railway underpass west of Highway 2 was built by the railway. By the beginning of 1978, this work was completed. Work resumed west of Highway 24 during the spring of 1982 to connect with Highway 401 near Woodstock to relieve the high traffic volumes along Highway 2. This included interchanges at Brant County Road 25 and Highway 53. A section from Highway 24 to County Road 25 was opened in November 1984, followed by the section west of there to Highway 53 one year later. Construction of the gap between Highway 53 and Highway 401 began in late 1985, followed by the Highway 401 overpass for the westbound lanes, which began in 1987. Transportation minister Ed Fulton ceremoniously opened the new freeway connection on September 26, 1988, completing the Woodstock to Brantford link. Highway 403 was briefly left with three discontinuous sections: Woodstock–Brantford, Ancaster–Burlington, and Oakville–Mississauga. Between Brantford and Ancaster, traffic was defaulted onto Highway 2, a four-lane road with numerous private driveways and at-grade intersections. On March 24, 1987, Chris Ward, MPP for Wentworth North officially announced that construction of the missing link between Brantford and Ancaster would begin in 1989. Construction did not actually begin until the summer of 1990. It included interchanges at Garden Avenue, Highway 52 and Highway 2. A continuous construction program was carried out over the next seven years, with the link opening on August 15, 1997. Highway 2, which was the only parallel route before the completion of Highway 403, was subsequently downloaded to regional jurisdiction. Though some officials considered Highway 403 to be a perfect example of a freeway construction process, it was not built without its share of controversy. In addition to the previously mentioned issues that occurred in 1969, portions of the freeway through Mississauga were built alongside established communities, leading to angry homeowners' associations pressuring the province for noise mitigation measures and compensation. In the late 1980s and early 1990s, the Mississauga section of Highway 403 was the site of more than two dozen fatal accidents over a five-year period, one of the highest rates in North America at the time, despite being up to modern road standards. This led Peel Regional Police and the media to nickname it the "Death Highway." In particular, the stretch from Mavis Road to Erin Mills Parkway has been the site of numerous accidents. In this section, Highway 403 features a downward slope as motorists head eastbound towards the Mavis Road interchange; drivers complain of having to slam on the brakes when traffic comes to a standstill, leading to rear-end collisions. There is also glare from the sun that causes vision problems throughout the day. The Hamilton-Brantford and Mississauga sections of Highway 403 were initially planned to be linked up along the corridor now occupied by Highway 407. However, the Bob Rae government altered these plans in 1995 due to budgetary constraints. It was also announced the Mississauga section of Highway 403 would be renumbered as Highway 410. Ultimately, this never came to pass. Consequently, Highway 403 was signed concurrently along the Queen Elizabeth Way in 2002, remedying the discontinuity. In early 2001, high-mast lighting was scheduled to be added to the unlighted Mississauga section between Highway 407 and Eastgate Parkway. In 2003, the right shoulders between Erin Mills Parkway and Mavis Road were widened for GO Transit and Mississauga Transit to run express bus services. These projects preceded the widening of Highway 403 between Highway 407 and Highway 401/410, through which a high-occupancy vehicle (HOV) lane was added in each direction; the project started in summer of 2004 and these opened on December 13, 2005. The HOV lanes and the dividing Ontario Tall Wall concrete barrier were constructed using the existing right-of-way provided by the grass median. Highway 403 between Woodstock and Burlington was formally dedicated as the Alexander Graham Bell Parkway on April 27, 2016. Sufficient right-of-way exists at the Highway 401/403/410 junction for a loop ramp from Highway 403 eastbound to Highway 401 westbound, and a directional ramp for the opposite movement. This would give Highway 401 eastbound traffic direct access to Cawthra Road, making it a full four-way interchange. Construction is underway on these links as of 2017, after Highway 401 was recently widened to a 12-lane collector-express system west of the interchange. In Oakville, improvements are being made to the Highway 403/QEW/Ford Drive interchange. As of 2017, traffic using the existing loop ramp in the NE corner to access Highway 403/QEW will be directed onto a new overpass instead of sharing the existing overpass with westbound Highway 403 traffic, which should allow for longer merging lanes since the convergence of Highway 403 and the QEW is an infamous bottleneck. At the present Highway 403 only connects to the QEW west of the interchange, but flyover ramps are being proposed from Highway 403 to the QEW east of that junction using the existing right-of-way which would allow for a direct freeway connection from Milton to south Mississauga. The following table lists the major junctions along Highway 403, as noted by the Ministry of Transportation of Ontario. 43.8 70 Main Street Formerly Highway 8; entrance ramps from nearby King St.
^ a b c "Highway 403 Extension Opens Friday". Toronto Star. August 15, 1997. Retrieved June 28, 2010. ^ a b Ministry of Transportation of Ontario (2010). "Annual Average Daily Traffic (AADT) counts". Government of Ontario. Retrieved February 26, 2010. ^ a b c d e f g h i j Ontario Back Road Atlas (Map). Cartography by MapArt. Peter Heiler Ltd. 2010. ISBN 978-1-55198-226-7. ^ a b c d e Google (December 10, 2011). "Highway 403: Length and Route" (Map). Google Maps. Google. Retrieved December 10, 2011. ^ "Highway 27 Interchange Fully in Service". The Globe and Mail. Toronto. December 4, 1971. p. 5. ^ Hughes, Rick (September 11, 1999). "Hwy. 403 Hill Used to Argue Both Sides of Red Hill Case". The Spectator. Hamilton, Ontario. p. A8. ^ Staff (June 26, 2006). "OPP Cracks Down on HOV Lane Abusers". CityNews.ca. Rogers Communications. Archived from the original on January 30, 2010. Retrieved December 15, 2011. ^ a b c Shragge, John G. (2007). "Highway 401: The Story". Archived from the original on March 28, 2008. Retrieved February 12, 2010. ^ a b c "Signs of the Times". Milestones. Ontario Good Roads Association. 2 (1): 26, 31. February 2002. Archived from the original on April 26, 2012. Retrieved January 2, 2012. ^ a b Annual Report for the Fiscal Year (Report). Ontario Department of Highways. March 31, 1958. Retrieved July 25, 2010. ^ a b A.T.C. McNab (1969). "Ontario". Proceedings of the... Convention. Canadian Good Roads Association: 64. ^ a b c Transportation Capital Branch (1988–1989). Provincial Highways Construction Projects. Ministry of Transportation. p. IX. ISSN 0714-1149. ^ a b c d Ward, Brace (January 4, 1981). "403: A Trouble-Free Way". Toronto Star. p. A16. It was designated in 1962, when traffic studies showed that additional "freeway capacity" would be required to handle traffic volumes between Hamilton and Toronto. ^ a b Calleja, Frank (November 8, 1979). "Doubts Raised About Route of New 403". Toronto Star. p. A19. ^ a b "New Highway Opens". Toronto Daily Star. August 18, 1980. p. A13. A new 3.6-kilometre stretch of Highway 403 was to be opened to traffic this morning, as part of a plan to divert traffic from the Queen Elizabeth Way through Mississauga. The new section will run from Highway 401 southbound to the Eglinton-Cawthra Rd. interchange. ^ a b Dexter, Brian (November 17, 1981). "Highway 403 Section Open to Traffic Today". Toronto Star. p. A18. It runs west from Erin Mills Parkway north of Burnhamthorpe Road, to Highway 5 in Oakville, where a spur to the Queen Elizabeth Way at Ford Drive has been used by traffic for several months. ^ a b "$87 Million Highway 403 Complete As Last Leg Opens". Toronto Star. December 2, 1982. p. A18. ^ a b Construction Program. Ministry of Transportation and Communications. 1976–1977. p. XII. ^ a b c Ed Fulton (September 26, 1988). "Remarks... At the Opening of Highway 403 (Between Highways 53 and 401)" (Press release). Woodstock, Ontario: Ministry of Transportation. ^ a b Boyle, Theresa (April 1, 1995). "Rae Announces 407 Extension". Toronto Star. p. A12. Rae also announced yesterday that the province will ask for private-sector proposals to design and construct the Burlington–Oakville link of Highway 403 as part of Highway 407. ^ Canadian Press (July 9, 1954). "4-Lane Road Start Seen". The Ottawa Citizen. p. 2. Retrieved October 20, 2010. ^ "Skyway is Crowded Moment it Opens, Tolls Start Nov. 10". Toronto Star. October 31, 1958. p. 25. ^ Ontario Road Map (Map). Cartography by C.P. Robins. Ontario Department of Highways. 1962. § R35–S35. ^ Ministry of Transportation of Ontario (April 1, 1989). Provincial Highways Distance Table. Government of Ontario. pp. 95–96. ISSN 0825-5350. ^ Information Section (August 21, 1969). "Highway 403 Opening on Wednesday August 27th" (Press release). Department of Highways. ^ "Residents Win Round Two in Battle of the 403". The Hamilton Spectator. August 27, 1969. ^ Information Section (September 2, 1969). "Highway 403, Opening" (Press release). Department of Highways. ^ "$700 Million Freeways West of Metro". Globe and Mail. Toronto. May 26, 1966. pp. 1, 25. The program calls for construction of a 23-mile section of Highway 403, from Burlington to the Macdonald-Cartier Freeway, west of Highway 27; a 12-mile freeway from Belfield Drive in Etobicoke, running northwesterly around Brampton to Georgetown; and a five-mile freeway from Richview Road in Etobicoke to Woodbridge. ^ Coleman, Thomas (July 12, 1975). "Drivers Will Wait Years Before Relief from QEW Jams". Globe and Mail. Toronto. p. 5. ^ a b "Ontario Government Notice". The Globe and Mail. Toronto. February 17, 1982. p. Classifieds 4. The Ministry of Transportation and Communications has undertaken a Preliminary Design Study to examine the upgrading of Highway 401 from Renforth Drive to Second Line West and Highway 403 from Highway 401 to Highway 10. The Preliminary Design Study has also examined the construction of the Highway 403 Extension, from Cawthra Rd. to Dixie Rd. In the mid 1970's some preliminary planning was completed for an express-collectors system on Highway 401 and 403 within Mississauga. ^ Transportation Capital Branch (1983–1984). Provincial Highways Construction Projects. Ministry of Transportation and Communications. p. XI. ISSN 0714-1149. ^ a b Transportation Capital Branch (1985–1986). Provincial Highways Construction Projects. Ministry of Transportation and Communications. p. IX. ISSN 0714-1149. ^ Meyers, C. (1986). 403 Arterial Extension. City of Mississauga Planning Department. ^ Funston, Mike (May 20, 1986). "Highway Extension May Ensure More Development, Report Says". Toronto Star. p. 6. ^ Funston, Mike (January 10, 1991). "Opening Extension of 403 Can Improve Traffic Flow". Toronto Star. p. 3. ^ Potter, Warren (October 27, 1994). "Eastgate Extension Boon to Motorists". Toronto Star. p. MS3. ^ Mitchell, Bob (December 5, 1991). "Work Starts on 403-410 Link". Toronto Star. p. MA2. ^ Mitchell, Bob (October 31, 1992). "403-410 Highway Link Ready, Seen As 'Boon' To Motorists". Toronto Star. p. A24. ^ Ontario Road Map (Map). Cartography by Cartography Section. Ministry of Transportation and Communications. 1978–1979. South-central Ontario inset. ^ Highway Program Development Branch (1982–1983). Provincial Highways Construction Projects. Ministry of Transportation and Communications. p. XII. ^ Transportation Capital Branch (1986–1987). Provincial Highways Construction Projects. Ministry of Transportation and Communications. p. IX. ISSN 0714-1149. ^ Transportation Capital Branch (1987–1988). Provincial Highways Construction Projects. Ministry of Transportation and Communications. p. IX. ISSN 0714-1149. 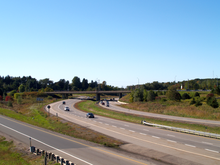 ^ "Highway 403 Link to Begin 2 Years Early". Toronto Star. March 25, 1987. p. A14. ^ Ontario Road Map (Map). Cartography by Geomatics Office. Ministry of Transportation. 1999. § R24. ^ Rickwood, Peter (August 14, 1979). "Mississauga to Study Highway Noise". Toronto Star. p. A12. ^ "Police, Jury Call for Steps to End Carnage on the 403". Toronto Star. January 9, 1993. p. A04. ^ "Drivers Showing Short Tempers on Busy Highways". The Globe and Mail. Toronto. August 3, 1993. p. A10. The 19-kilometre section of Highway 403 between Highways 401 and 5 is known as the Death Highway because it has one of the highest death rates of any highway in North America. There have been 27 fatal accidents on the section since 1987. ^ Rosella, Louie (July 17, 2007). "Highway 403 Stretch Dubbed Infamous Crash 'Hotspot'". Mississauga News. Archived from the original on July 15, 2007. Retrieved March 16, 2014. ^ Mitchell, Bob (April 6, 1995). "Rae Announces 407 Extension". Toronto Star. p. BR03. ^ Ministry of Transportation of Ontario (January 30, 2001). "Ontario Government Continues to Improve Road User Safety on Highway 403" (Press release). Government of Ontario. Archived from the original on April 15, 2014. Retrieved January 14, 2012. ^ "Backgrounder on Mississauga's BRT". City of Mississauga. March 2007. Retrieved January 14, 2012. ^ Brennan, Richard (December 13, 2006). "Carpool Lanes Praised". Toronto Star. Retrieved January 16, 2012. ^ Ministry of Transportation of Ontario (December 5, 2005). "First-Ever High-Occupancy Vehicle Lanes Mean Less Congestion, Better Transit". CNW Group. Retrieved August 28, 2014. ^ Cameron, Grant (September 15, 2004). "$63.6M Earmarked for HOV Lanes". Daily Commercial News. Reed Construction Data. Archived from the original on December 4, 2011. Retrieved January 16, 2012. ^ Marion, Michael-Allan (April 27, 2016). "Take A Drive Along Alexander Graham Bell Parkway". Brantford Expositor. Archived from the original on 2016-04-29. Retrieved April 29, 2016. ^ Highway 401 Improvements From Highway 410/403 Interchange to East of the Credit River Transportation Environmental Study Report (PDF). vol. 1. Aecom. August 2005. p. iii. Retrieved January 16, 2012. ^ Central Region (June 2003). Transportation Environmental Study Report: Highway 403 and Queen Elizabeth Way from Trafalgar Road to Winston Churchill Boulevard (PDF). Ministry of Transportation of Ontario. Retrieved January 30, 2018. ^ Fragomeni, Carmela (November 4, 2010). "New Burlington-Highway Interchange Open". The Hamilton Spectator. Retrieved November 5, 2010. Shragge, John & Bagnato, Sharon (1984). From Footpaths to Freeways. Ontario Ministry of Transportation and Communications, Historical Committee. ISBN 0-7743-9388-2. Stamp, Robert M. (1987). The Queen Elizabeth Way, Canada's First Superhighway. Boston Mills Press. ISBN 0-919783-84-8. Wikimedia Commons has media related to Ontario Highway 403.